Eight years ago, Adam Neumann and Miguel McKelvey looked at how people were working in office blocks. They thought they could do it better. So they started a co-working space in New York called WeWork. Its genesis was that startups and freelancers were more productive when they worked in a space that wasn't dull and soul-sapping. Today, it has 335 locations around the world serving hundreds of thousands of people. Last week, it received a fresh funding injection of $3bn (€2.6bn) from Softbank, bringing its investment to a staggering $12.1bn. (€10.6bn). And it is now announcing a sixth location in Dublin, the Charlemont Exchange, its biggest in Ireland. 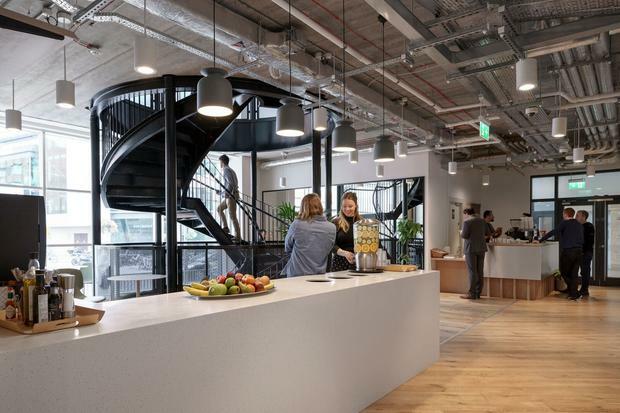 Hosting 2,600 people by itself, the massive 14-floor building by the Grand Canal represents a big bet on Dublin: the Irish capital is now one of WeWork's biggest per capita investments outside the US, rivalling London on a head-to-head basis. The company's Charlemont development, first revealed by the Irish Independent in July, is tipped to house Amazon as an anchor tenant, It's WeWork's third building in the Dublin 8 area, adjacent to its Iveagh Court location and its upcoming Harcourt Street facility. And it comes amid a series of major tech expansions being undergone here by Facebook, Google and a dozen other tech multinationals. Announcing a sixth location in Dublin is quite a statement about how WeWork sees the city and its own future here. Are there more buildings to come? 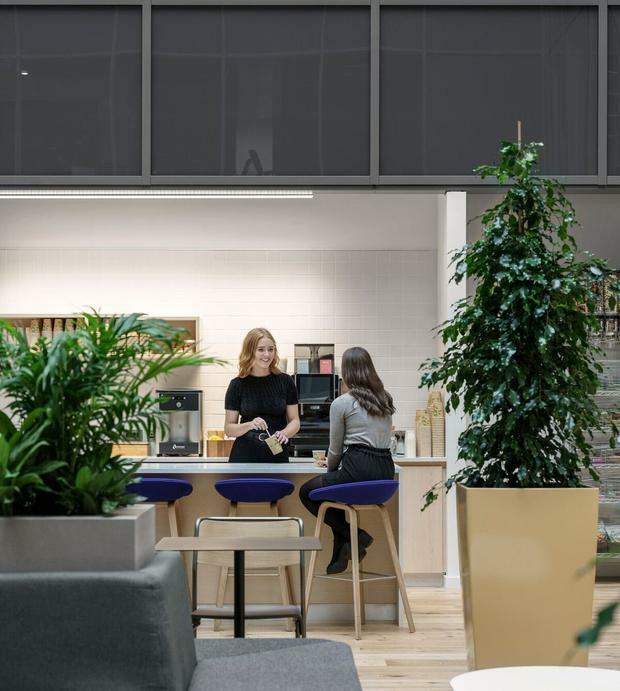 "I'd say watch this space," says Leni Zneimer, WeWork's general manager for the UK and Ireland. "To open six locations in a city as innovative as Dublin is not uncommon." Even still, Manchester is twice the size of Dublin and it has two WeWork locations. So why the rapid expansion here? "It points to our confidence in Dublin and our commitment to the city as a whole," she says, "The Iveagh Court, for example, is completely full. We're seeing incredible uptake here." Is there a natural capacity to a city Dublin's size for a co-working infrastructure? "We always want to test the boundaries of a city's maximum," she says. "We never try to cap it as at a certain number, so there isn't a cap in sight. We're just getting started." Is there life outside the capital? Would WeWork consider different Irish cities? "Our eyes are always open to other cities," says Zneimer. "And there are many unbelievable cities that we're not yet in. But we value the depth we can invest in a particular city." Part of this, she says, is the availability of networked facilities between WeWork sites for members working in or visiting that particular city. Right now, Dublin dwarfs other Irish cities for international business throughput and an established tech base. The company's philosophy, Zneimer suggests, is more about diving into this hub rather than setting up what might be satellite stations around the country. When we think of co-working spaces, the image conjured up is often one of small, plucky startups in T-shirts video-conferencing with investors and clients as they sip juice and eat pizza in an open-plan area with timber floors and exposed brick walls. WeWork's own web literature sets the tone. "The nature of work is changing," it says. "Recruitment, retention, innovation, and productivity now require not just coffee, but also yoga, not just printers, but also art installations." Increasingly, this is a pitch aimed at a lucrative new client: the corporate enterprise. Without any doubt, one of the main reasons that WeWork has scaled so quickly in the last two years (to some 350 locations across its targeted cities) is because of its appeal to big, big firms. Goliaths like Microsoft, Dell, Deloitte and Salesforce all want to have a presence in spaces like this. They see themes of 'disruption' and 'creativity' and estimate that there's a decent chance of tapping into some of it if they set up divisions in the physical locale of their high-growth junior industry counterparts. "Twenty-nine per cent of our member base is now from the enterprise segment," says Zneimer. "Among the 5,000 members we have so far in Ireland are hundreds of companies." A layman might ask: doesn't that wreck the buzz? You choose an environment populated by bright, energetic, creative types but start seeing suits and ties walking around a bit more? "One of the key words here is serendipity," says Zneimer. "Everyone gets coffee in the same place. Ultimately, preconceived options of archetypes get stripped away. Instead of stereotypes over appearance, it brings it back to work culture and energy. And it's ultimately about a higher sense of satisfaction and retention." Does this mean that the startup people and colourful creatives that make up the 70pc of WeWork members become, in some way, part of the product when going out to get enterprise members for the locations? "It's true that small companies, entrepreneurs and startups are the symbol, the beacon of ideas," she says. "And there is a rhythm that's born of a small company. It's new and challenging. And yes, that's how WeWork communities were initially formulated. Initially, that's what enterprises saw and liked. They sensed this energy, this inspiration. So small companies are instrumental in creating our product insofar as it's community and energy on the ground. But ultimately the product is the sum of all the companies that are there." How about corporate types outside the Microsofts, the Salesforces, Twilios and Dells? Even though such firms are blue-chip enterprises which, by now, have some conservative, cautious elements about them, they're still in an industry - tech - which always has an eye on upstarts and new ways of working. But what of the Glanbias, AIBs and CRHs? Is WeWork mainly a tech house? "We absolutely see local interest as well," says Zneimer, although without naming any Irish enterprise clients. "I don't think there's a line between tech enterprises and local Irish enterprises." The basic mission of WeWork, though, remains the same. Workplaces are changing. Younger people, in particular, don't want to be in stuffy, traditional office blocks with all of the physical and cultural restrictions that they bring. "There's a basic shift in the way that people are organically working," says Zneimer. "For example, there's been an increase in the number of people wanting to start businesses. You also see an ability to work more flexibly and to travel more often. But you need different means of working to do this. "Ultimately we're responding to a different type of work, applicable to the entire workforce. We're also expanding what we call an intelligent collaborative framework which is about engagement, retention and the future of work." What about Brexit? Tech giants such as Facebook and Google are doubling down on properties in Dublin while slowing expansion down in Britain, a trend that has caught the attention of several economic commentators. Is Brexit having any effect on WeWork's investments here, possibly at the expense of further investment in the UK? Without explicitly saying so, Zneimer suggests that this isn't the case. "I can't speak directly to that, except to say that our business is as strong as ever in London," she says. "We haven't seen the London market slow down at all. We've been there since 2014 and now have 30 open locations." Zneimer points to one of the company's landmark developments in London's Devonshire Square, a campus of 10 buildings that's surrounded by restaurants and other metropolitan attractions, located between Shoreditch and the City. "If you look at the ecosystem that we're developing there, it points to the level of investment we're doing in London," she says. "London is very important to us." 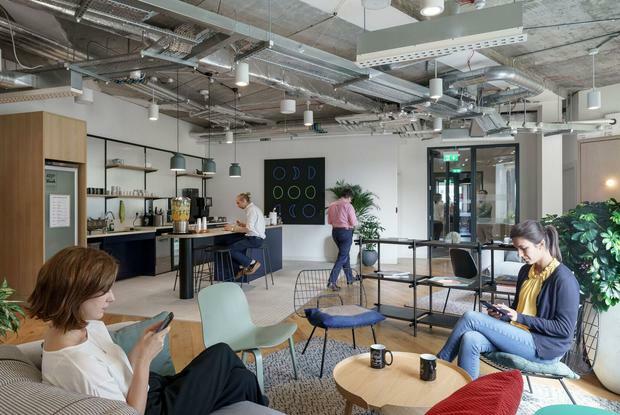 Indeed, the UK capital is WeWork's second-biggest global location after New York. Its occupancy rates there are higher than average, at around 90pc. Part of WeWork's schtick is the interior design of its work spaces. Because this responds to trends, it changes quite quickly. On the Charlemont building, which is huge with large windows, the company is considering a retro theme. "We'll have a 1970s vibe," says Zneimer. "It's going to have a lot of natural light flooding in. It's going to very open and inclusive and somewhat relaxed. You'll see white walls, murals, frames and a lot of colour. We'll also be branching out in terms of the art we have, including 3D art and mobile sculpture." It will open in the spring of 2019, she says. The Irish spring, which runs from February to April? Or the American one, which runs to May? "The Irish spring," she says. "When we're in Ireland, we go by the springtime rules here."